AAT Bioquest offers a suite of online tools to aid researchers in post-experimental data analysis. These tools are free to use for all researchers and complement our extensive catalog of assays and kits. Mitochondria’s performance is imperative to cell viability, use mitochondrial-selective tools to monitor them. Nuclear DNA fragmentation is a strong indication of late-stage apoptosis and a cell’s unwavering commitment to the cell death program. 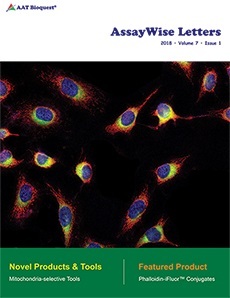 The TUNEL assay technique takes advantage of this feature to identify apoptosis at a single-cell level. Lysyl oxidase (LOX) has been the focus of study due to its potential role in the metastasis of various cancers. Two methods to quantify LOX activity are reviewed: a radiometric method using tritium and a fluorimetric method using Amplite™ Red.